While Plastic Logic's Que reader is intended for business-minded folks and has a focus on schedules, BlackBerry syncs, and documents, it would still make a fantastic reader due to its size and design. If it weren't $650, that is. 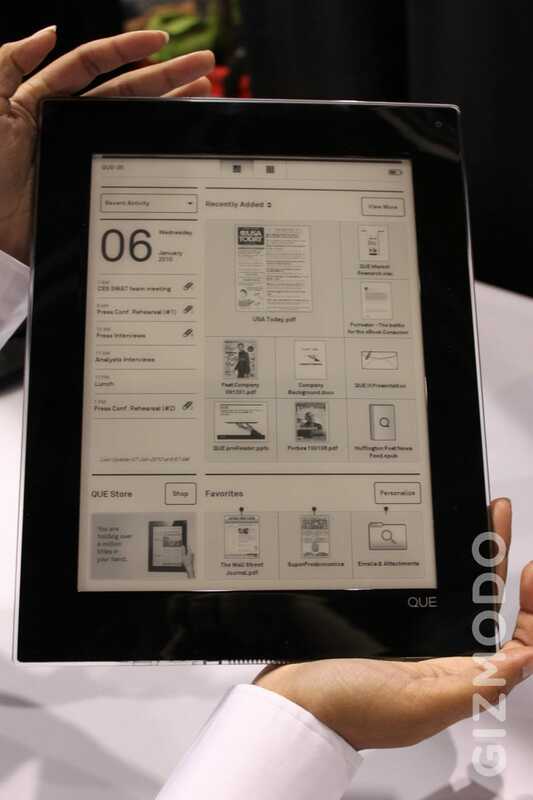 The Que is the tall and slender beauty among many of the readers on the market. Next to it, the Kindle and Nook both look chubby and tiny. The unfortunate part is that the large screensize comes at a price: $650 for a 4GB version and $800 for an 8GB 3G-enabled model. Each of the versions comes with Wi-Fi and Bluetooth, of course. Holding the reader is blissful. It's incredibly light, but feels firm and solid—not at all plasticy or flimsy as I'd expected. While that was a pleasant surprise, the refresh rate of the Que was not. It felt slower than two readers I've played around with recently—the Nook and the Kindle.